The staff were very friendly, the place was so quiet and chilled, the location is not very far from the city. -Every thing was perfect , the villa looked the same as the photos and even better. -The pool was big and clean -The breakfast was very tasty. - very friendly and helpful staff. We booked the BNG villas last minute as a villa we had booked was below our expectations. We couldn’t be more grateful that we did. The Villa was a wonderful space and very clean. It was great to have our own pool, a massive bathroom and the friendliest staff assisting us. It’s in an area that’s quiet, but not too far from the hustle and bustle of Seminyak. Guys this villa is a must have! It is stunning. When you arrive you will be surrounded with nothing but beautiful flowers, greens and amazing azure blue pool. And than the “party” begins when you enter the vila. I could not believe my eyes. Villa is super spacious, everything inside the villa is designed to be nothing but comfortable and easy to go-jump straight to the pool when finishing your breakfast-first day they bring it to your villa. Its peaceful and quiet, its up to you if you stay at the property, enjoy both pools and the greenery around or go for a walk down to Seminyak square or nearest bar Nook. Dogs barking around by night, having a good morning shower with mini spiders and flies is in my sense exotic. I am from rural countries so for me this is totally nothing. My husband told me to NOT kill the spider! And all this stylish balinese details-oh i just love it. Bali was perfect experience! Totally recommend it!!!! The staff were great and the villa itself became like a home. Will definitely be back. The villa is little far away from the center. If you know how to ride the motorbike is better to live there.. I can say this price is fit for the property. But I don’t think this is 4 star. I would give 3 star. Is more fit with this place. Lovely staff and a nice private pool. The outdoor bathroom was lovely. 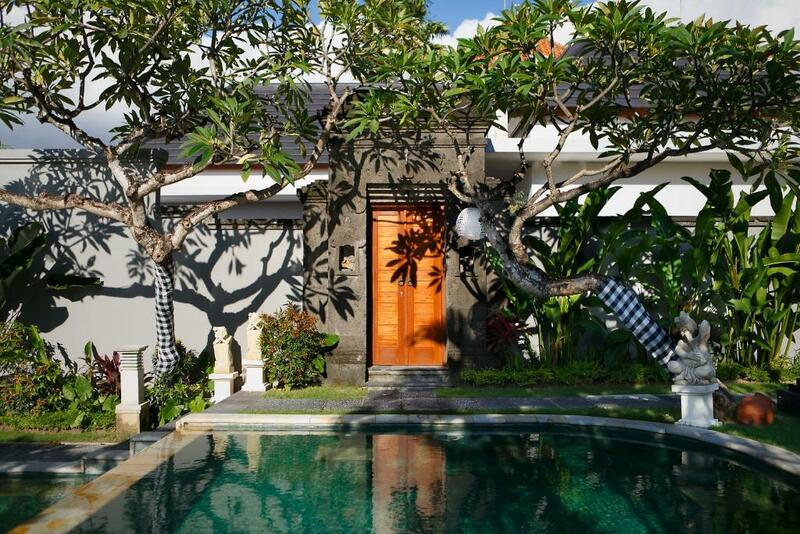 Situated in a nice, quiet location (minus the local animals) just outside of Seminyak. We loved the grounds of the compound. The gardens and the shared pool in the communal area were really beautiful. Our villa felt very private, the pool was lovely (you can't beat having your own!) and the room was extremely clean. The villa organises a free shuttle around the area. We didn't use this as we had rented our own car but I think this must be really useful because the villas are not really in walking distance to the town. There is a great restaurant not far however, called Nook. We highly recommend it! I also liked that the hotel provided a WhatsApp contact number before arrival. We were due to arrive very late in the night so this gave me extra confidence that someone would be there for us when we arrived to check us in. The reception is open 24 /7. They also provide a free shuttle to and from the airport which is great (our experience is that not every hotel/establishment offers this for free). Very great location , staff was amazing and ready to give the best hospitality . They didn’t want me to move a finder and wanted to provide SUPERB service . Lock in a great price for Bali Nyuh Gading Villas – rated 8.9 by recent guests! Bali Nyuh Gading Villas This rating is a reflection of how the property compares to the industry standard when it comes to price, facilities and services available. It's based on a self-evaluation by the property. Use this rating to help choose your stay! One of our best sellers in Seminyak! 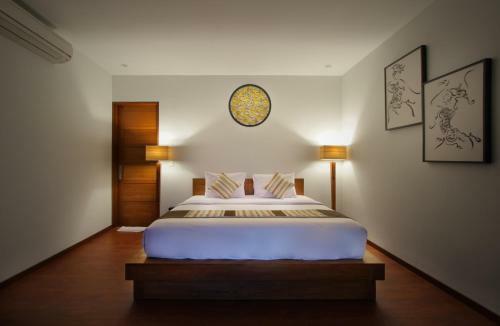 Featuring a restaurant, Bali Nyuh Gading Villas is located a 5-minute drive to Seminyak area. Free WiFi access, free scheduled shuttle service to Seminyak area, Beachwalk Shopping Center and Canggu Club, as well as free return airport transfer. 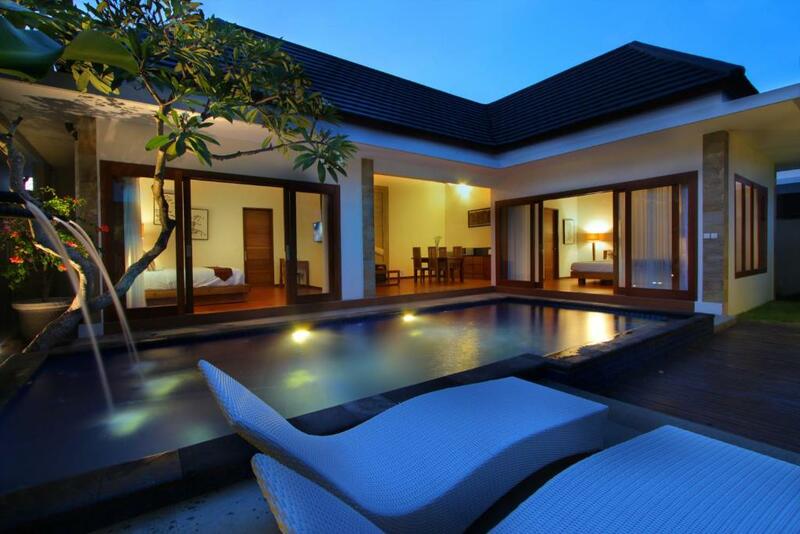 Set amid tropical gardens, the villas feature a private pool, air conditioning and a seating area. Decorated with a blend of modern and traditional Balinese design, the villas are fitted with a flat-screen satellite TV and DVD player. It includes a kitchenette with refrigerator and microwave. Private bathroom comes with a shower, bathtub and hairdryer. Guests enjoy the convenience of in-villa dining as well as in-villa spa and massage treatments at an additional charge. There are barbecue facilities available for use. Well-known restaurants around Seminyak area such as Kudeta, Potato head and Nook are just a 10-minute drive away. Operating a 24-hour front desk, the staff at Bali Nyuh Gading Villas can assist guests with car hire, airport transfer and laundry at additional charges. Tour arrangements can also be done at the tour desk. 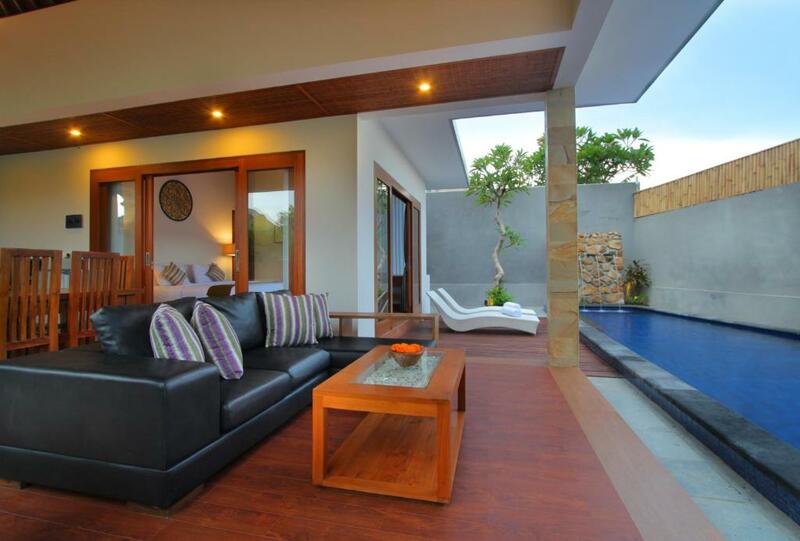 Bali Nyuh Gading Villas is 0.6 mi away from Canggu Club. Ngurah Rai International Airport is a 20-minute drive away from the property. 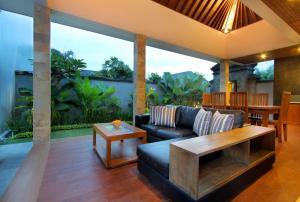 When would you like to stay at Bali Nyuh Gading Villas? Featuring a blend of modern and traditional Balinese design, this villa is set amid a tropical garden. It is furnished with a kitchen, living area with satellite TV and a private pool. 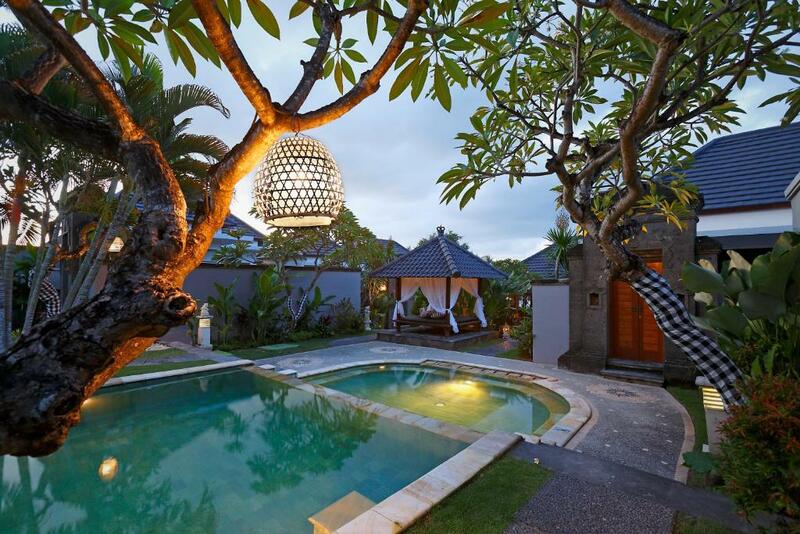 A mix of traditional and modern Balinese design, this villa is set amid a tropical garden. It is equipped with a kitchen and living area with satellite TV and DVD player. Also comes with a private pool. - Daily light lunch or light dinner during stay based on occupancy. - One-time relaxing spa treatment for 2 hours based on occupancy. 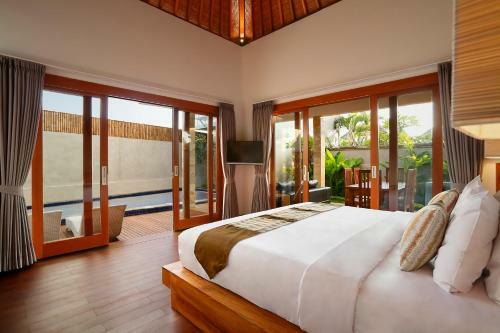 The overall concept of the villa is designed to maximizing privacy of the guest, the design blends Balinese traditional and modern elements combined with luxurious amenities that invites guest to experience the pleasures of tropical living. The resort offers 11 private pool villas, consist of : 8 units One Bedrooms Villas, 2 units Two Bedrooms Villas and 1 unit Three Bedrooms Villas and each villa features private entrance, private garden, private pool and living & dining area. 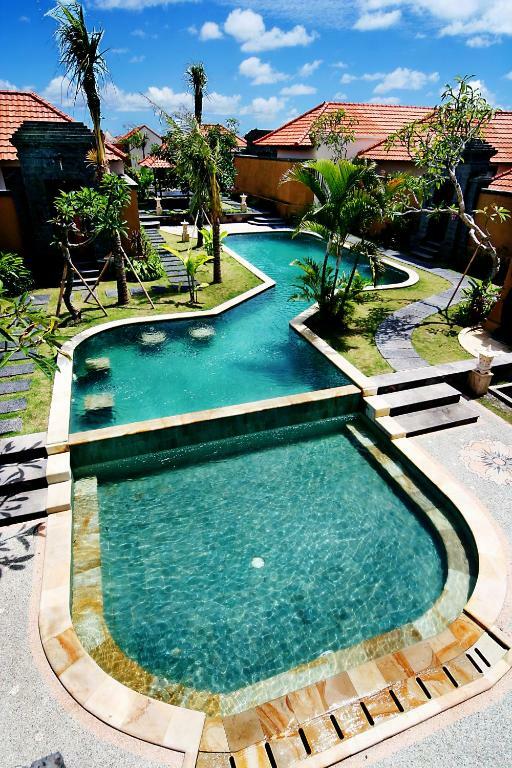 Bali Nyuh Gading – Luxury Villas & Spa is a boutique resort located in the peaceful area of Umalas - Seminyak. 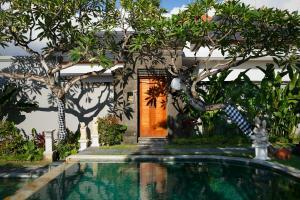 located in the peaceful area of Umalas - Seminyak. Just 35 minutes drive from Bali International Airport and 10 minutes drive to the Beach and central Seminyak, other facilities including ; a restaurant, swimming pool, library, spa, 24 hours butler & security, garden venue and parking space. House Rules Bali Nyuh Gading Villas takes special requests – add in the next step! Bali Nyuh Gading Villas accepts these cards and reserves the right to temporarily hold an amount prior to arrival. Attention to detail. The food was awful and made me sick. There were very few options...no cocktails available even though they advertised them. As the villa is located in a remote bush, it would make sense to offer these value adds. I needed to borrow an iron and also had to wait for over half an hour until they retrieved it from another property. I couldn’t believe I was staying at the place with incredible reviews. Do not mistake this place for Nyuh Bali Villa. The villa was clean, private and secure. We loved everything about the villas. Privacy, staff, licstion. A special thank you to Gere and Mira for being so friendly and going out of their way to make us feel welcome. The rest of the staff too. Such wonderful, professional people. Breakfast was excellent, villa always clean, sheets and towels changed daily, very private. Wonderful restaurant called Nook about 10 min walk from property and free shuttle into Semyniak was a bonus. Will recommend to all our friends and family and will stay there on our next trip to Bali. A beautiful boutique, luxury villa , modern but with a balinese feel. Having your own pool fantastic yet can also use the main central pool . In a quiet location but very accessible to local restaurants, walking distance to the Nook , Cage Organic and not far from Seminyak . Free shuttle into Seminyak provided from 9- 5pm . Free shuttle from /to airport. continental breakfast is more buffet style-with choice of fresh fruits, cereals, American or Indonesian food. Can have delivered to your villa or mingle with other guests in dinging area. . staff are just beautiful people , nothing is too much trouble . Always helpful, offering advice, where to visit, arrange drivers for you to take you on day trips around Bali , restaurants- ring and book for you . Thank you Gede, Mirmah, Wirana Aggung, ..all of staff are lovely- too many names to mention. Loved the Sandari Day Spa Mirmah recommended- very upmarket ! Cant fault . Definitely will stay with them again. -The location was a bit far from the center of the city, would recommed using grab or renting a scooter. -The food ordered from the menu left in the villa needs to be improverd. Great stay, I would definitely stay here again. Absolutely loved the property. It is away from Seminyak central streets on a parallel street so it's quiet and boutiquey. Everything about the villa is just perfect. Pool is great size, clean and the depth is just good. Free drop off service is provided to Seminyak Square. Staff very friendly and helpful. Another trick is - restaurant Nook and Tetsuo is only a few minutes walk away and they open till late! So absolutely nothing nothing to complain about. The wonders pool and outdoor area, larger than expect as was the bed and bathroom. The staff were so friendly we couldn’t fault it. Only one thing location, could be closer to main streets , where more restaurants , shops, markets. But if you will rent a scooter what will be no problem either. The stay in BNG villas was amazing. We really enjoy our private swimming pool. Bed was comfy , room clean . Staff incredibly helpful. They help us to rent scooter, they gave us tips what to do and what to see , so basically you can get all information from them if you need it. Especially I would like to say thanks for Wayan , he was the best. So for staff 10+++. the quality and variety of the breakfast menu. thank you. friendly host. attractive and comfortable interior design. privacy. value for money.